Geelong left their run too late, going down to Hawthorn by 11 points at the MCG on Saturday afternoon. The Hawks won their fourth straight contest in the process – a feat they last achieved during a nine-match streak in 2016 – to strengthen their top-four chances. The 10.11 (71) to 8.12 (60) triumph in front of 59,529 fans provisionally places them in third spot, with Geelong a win outside the top eight. A Jaeger O'Meara goal as the match entered its final minute put paid to the Cats' challenge, after they threatened to overturn a 26-point three-quarter time deficit with the only other three majors. Ruckman Jon Ceglar set up the O'Meara sealer with a clearing kick from a stoppage, with Paul Puopolo chasing the Sherrin down and Isaac Smith and Harry Morrison also involved. It was the fourth match in five meetings between the clubs to be decided inside two goals. Tom Hawkins had the chance to slash the difference to one point but misfired on a set shot from 25m on a slight angle, and Gary Ablett failed to score from another attempt shortly after. Finals are as good as certain for Alastair Clarkson's men now, but the Cats can't slip up against Gold Coast or Fremantle at GMHBA Stadium in the last two rounds if it expects to take part in September. "We're just so pleased, particularly for our younger players," Clarkson told reporters. "We strangely enough didn't have a focus so much on the game in terms of ladder position and (our) finals push, as much as we did, 'Here's a finals-type atmosphere right now, boys, and what a great opportunity to play (on the) MCG'. "If ever we get the chance somewhere down the track, whether that's the end of this year or the end of next year or beyond that, these are the types of games you love to play in and so that was a dress rehearsal for what might come. "At the end of the game, we're probably a bit lucky that they missed gettable shots in the last five minutes of the game." Hawthorn never trailed from the moment Luke Breust punished a Cats turnover as part of a five-goal-to-none second term that put them on the path to the all-important win. Rhys Stanley exited the game for good with another calf injury in the same period in a double blow that forced Geelong to use Mark Blicavs and 191cm Jack Henry in the ruck for the rest of the day. Teenage Hawk James Worpel – one of the Geelong Falcons' premiership-winning co-captains in the TAC Cup last year – capped his eventful month with an excellent performance in the midfield. His 23 disposals and eight tackles followed his match-winner against Essendon last week and 32 touches against Carlton in round 18. The onball brute's best moment came in the third term when he unflinchingly won a hard ball against Joel Selwood – with the rivals coming from different directions – that set up a Jack Gunston goal. Tom Mitchell shook Scott Selwood's close tag to win a team-high 32 possessions (13 contested), while veteran Shaun Burgoyne (20, 13 tackles, seven clearances) was also superb. Young defenders Ryan Burton and Blake Hardwick were others to perform key roles, but there was no shortage of contributors in brown and gold. 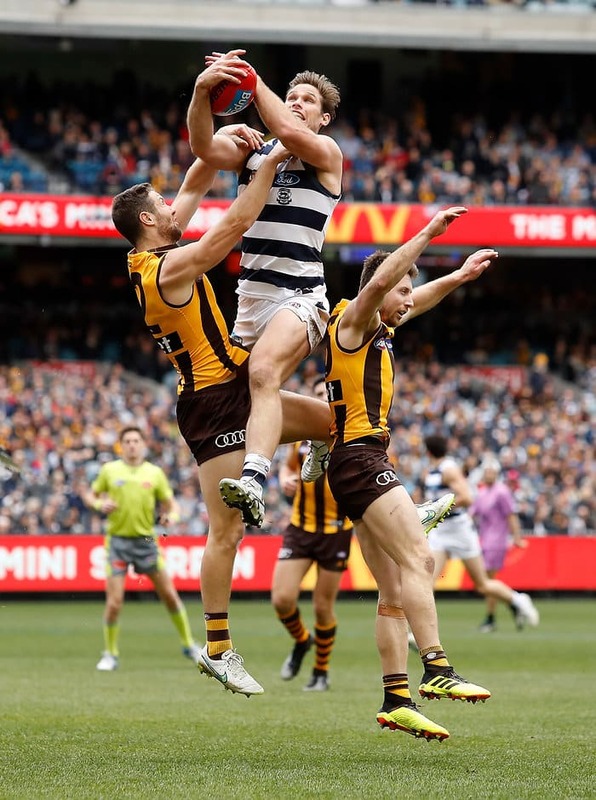 There was the opposite problem for the Cats, who left too much to Patrick Dangerfield – who briefly left the field in the third term with a corked hip – and Ablett in the first three quarters. Dangerfield finished with 40 disposals and nine clearances, while Ablett had 32, eight clearances, eight tackles and three goals in a vintage display. But it wasn't until fellow star midfielders Mitch Duncan (24) and Joel Selwood (23) came to the party that Geelong caught fire, a point coach Chris Scott eluded to afterwards. Selwood had just one kick to half-time and 15 possessions to the last break. "The comeback was good – I don't think anyone can accuse us of not hanging in there and believing we can win when the chips are down," Scott said. "I think the more pertinent questions is, 'Why are we waiting so long to play that way in games?'. We clearly had the ascendancy in the last quarter. "I think it'd be a little superficial to reflect on the game and say one bad quarter (the second) cost us, but it certainly had a big impact." The match was a tense struggle early and it wasn't until Hawkins' superb set-shot finish from a tight angle – 19 minutes in – for a goal to be registered. A dubious free kick to Ablett, against Isaac Smith, doubled the Cats' goal tally and the Hawks went to quarter-time without a major. It was the first time since round four, 2007 that Hawthorn failed to kick a goal in the first quarter against Geelong. Hawthorn: The Hawks lost Jarryd Roughead before the match, with the skipper relenting to ongoing ankle soreness. Blake Hardwick battled a sore shoulder throughout the afternoon, while Ryan Burton came from the field in the last quarter after a head knock. Geelong: Ruckman Rhys Stanley suffered a recurrence of his calf injury and didn't play from early in the second term, forcing the Cats to reshuffle their structure. Zach Tuohy also hurt his hand in the opening term and briefly went into the rooms at quarter-time for treatment. Hawthorn heads to Etihad Stadium on Saturday night to face St Kilda, while Geelong returns to the comforts of GMHBA Stadium earlier on the same day to host Fremantle.